A man carries a child inside the camp Moria on the Greek island of Lesvos. The first deportations of non-Syrian refugees from Moria and other camps to Turkey under the EU-Turkey-deal startet in April 2016. The currrent rulings by the Council of State open the door to forcible returns of Syrian asylum seekers to Turkey. Foto: picture alliance / AP Photo. RSA and PRO ASYL are deeply concerned about UNHCR’s decision to stay silent about the violations of basic refugee rights in the name of EU-Turkey deal, especially given the present regime in Turkey. 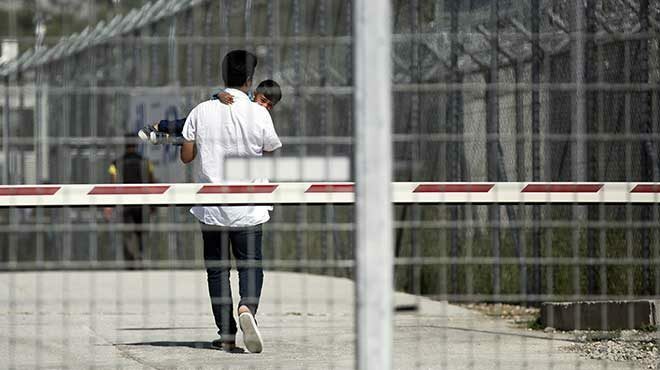 In a joint legal note, Refu­gee Sup­port Aege­an (RSA) and PRO ASYL have ana­ly­zed the role of the UN Refu­gee Agen­cy (UNHCR) in a rule of the Coun­cil of Sta­te (Greece’s hig­hest admi­nis­tra­ti­ve court) against app­li­ca­ti­ons made by two Syri­an male asyl­um-see­kers chal­len­ging the nega­ti­ve decisi­ons by one of Greece’s Asyl­um Appeals Com­mit­tees that con­si­de­red Tur­key a ‘safe third coun­try’ for them. RSA and PRO ASYL con­si­der brin­ging cases of Syri­ans facing depor­ta­ti­on to Tur­key befo­re the European Court of Human Rights in Strass­bourg. Cor­re­spon­dence pro­du­ced by UNHCR was of par­ti­cu­lar impor­t­an­ce on the out­co­me of the two cases at all sta­ges of the asyl­um pro­ce­du­re. RSA and PRO ASYL high­light that both the Greek Asyl­um Ser­vice and the Appeals Com­mit­tees have sys­te­ma­ti­cal­ly based their fin­dings that Tur­key is a ‘safe third coun­try’ on two let­ters by UNHCR when issuing inad­mis­si­bi­li­ty decisi­ons in cases of Syri­an refu­gees. The rulings by the Coun­cil of Sta­te in the­se two cases open the door to for­ci­ble returns of Syri­an asyl­um see­kers to Tur­key under pro­vi­si­ons of the EU-Tur­key deal. UNHCR has avoi­ded any public posi­ti­on or inter­ven­ti­on that could com­pro­mi­se the poli­ti­cal dyna­mic or tri­bu­nal pro­cee­dings around the reco­gni­ti­on of Tur­key as a safe third coun­try. RSA and PRO ASYL call on UNHCR to take a more cri­ti­cal stand on the issue of Tur­key qua­li­fy­ing as a safe coun­try for refu­gees. Refu­gee Sup­port Aege­an (RSA) is a Greek non-pro­fit orga­ni­za­ti­on focu­sing on stra­te­gic liti­ga­ti­ons in sup­port of refu­gees, moni­to­ring human rights vio­la­ti­ons, as well as the pro­vi­si­on of legal, soci­al and huma­ni­ta­ri­an sup­port in indi­vi­du­al cases. Mem­bers of the orga­ni­za­ti­on are based on the islands and on the main­land and visit dif­fe­rent parts of Greece in order to docu­ment the situa­ti­on the­re. RSA is the imple­men­ting part­ner of the PRO ASYL Foun­da­ti­on pro­ject RSPA – Refu­gee Sup­port Pro­gram Aege­an in Greece.